Objectives: Skin acts as the diagnostic window to many internal organs including the renal system. Subtle changes in the skin may act as clues to the underlying renal pathology. The present study was undertaken to evaluate and compare the cutaneous manifestations among the spectrum of renal failure including post-transplant patients. Materials and Methods: Hundred patients with chronic kidney disease including post-transplant patients were recruited in the bring highlighted line here. In the study conducted at Department Detailed cutaneous examination was performed and findings were recorded and compared among the study groups. Results: Total 61% patients had cutaneous manifestations and 40% had more than one finding. The most common cutaneous finding was xerosis noted in 53%, followed by pruritus in 42%, pallor 37%, pigmentation 34%, and cutaneous infections in 33%. Nail involvement was noted in 43%. The most common nail finding was half and half nail seen in 30%, followed by brittle nails in 20%, beau's line 18%, and leukonychia 16%. The prevalence of skin findings was significantly more among the patients with end stage renal disease and those undergoing dialysis. The post-transplant group showed increased prevalence of infections. Conclusions: Dermatological manifestations increase with duration and severity of renal disease. Though renal transplantation and hemodialysis reverse the metabolic derangement in these patients, they predispose to a number of cutaneous complications. Chronic kidney disease (CKD) is a pathophysiological condition resulting in the decrease of the quantitative and qualitative activities of the nephrons, resulting subsequently into end-stage renal disease (ESRD). Skin being the most visible and accessible organ of the body, functions as an important diagnostic window to the internal organs including the renal system. There is a paucity of studies assessing cutaneous manifestations in post-transplant patients in the Indian setup. The present study was undertaken to evaluate and compare the cutaneous manifestations among the spectrum of renal failure including post-transplant patients. Patients fulfilling the inclusion criteria aged 18 years and above were recruited in the study from October 2011 to March 2013. A total of 100 patients were recruited with 25 in each study group. The protocol was approved by the ethical committee and informed consent was obtained. Patients with Stages 1 and 2 CKD with glomerular filtration rate >60 ml/min/1.732 m 2 and those refusing consent for the study were excluded. Patient's demographic details were recorded. Detailed note regarding the onset, duration, progression, and associated symptoms of any cutaneous lesion were made. Various cutaneous lesions, their distribution, morphology were recorded and photographed. Clinical examination was supplemented by relevant laboratory data including complete blood count, kidney function tests, blood sugar, serum proteins, and urine routine examination. The statistical analysis was carried out using Statistical Package for Social Sciences (SPSS Inc., version 17.0 for Windows, Chicago, IL, USA). Continuous data were given as mean ± standard deviation, range or as median with an interquartile range as appropriate. Normality of quantitative data was checked by measures of Kolmogorov-Smirnov tests of normality. For comparison of age and duration of disease one-way ANOVA was applied for comparison of 4 groups. Discrete categorical data were presented as n (%): For categorical data comparisons were made by Pearson Chi-square test or Fisher's exact test as appropriate. All statistical tests were two-sided and performed at a significance level of P = 0.05. The patients age ranged from 20 to 80 years with most number of patients in 30 to 39 years age group. There was a slight male preponderance (male: female = 54:46). The duration of the disease ranged from 7 months to 16 years (mean 3.7 ± 3.5 years). Chronic glomerulonephritis was the most common cause of CKD affecting 48 (48%) of patients, followed by diabetic nephropathy in 28 (28%) patients and hypertensive nephropathy in 18 (18%) patients. A total of 61 (61%) patients had cutaneous manifestations and 40% of these had more than one cutaneous finding. Pallor was noted in 37 (37%) patients. Among the individual study groups, the prevalence of pallor in Group A was less than in Groups B and C (P = 0.002 and <0.001, respectively). Group D had significantly less pallor than in Group C (P = 0.001). Total of 53 (53%) patients had xerosis. Maximum prevalence was seen in Group C, 24 (96%) while the minimum was in Group D 2 (8%) [Figure 1] and [Table 1]. Xerosis in Group A was significantly lesser as compared to Group C (P < 0.001). The prevalence was higher in Groups B and C as compared to Group D (P < 0.001 in both cases) [Table 2]. Total 34 patients had pigmentary anomalies. 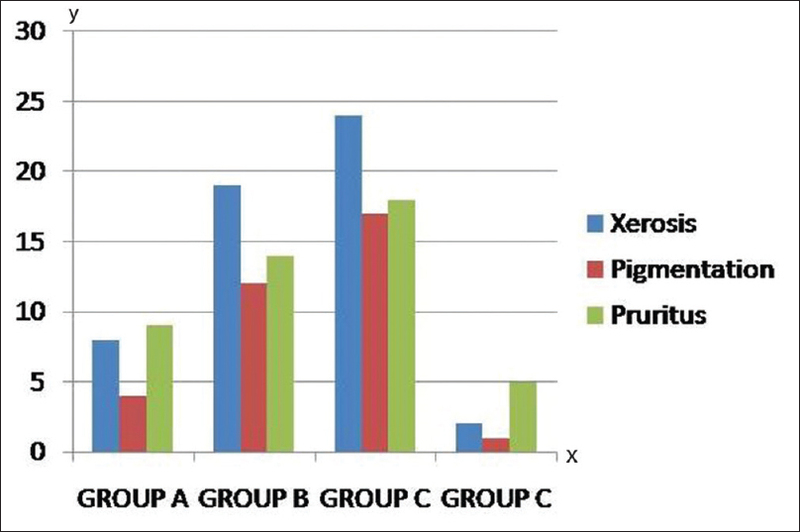 Maximum prevalence was seen in Group C, 17 (68%) [Figure 1] and [Table 1]. 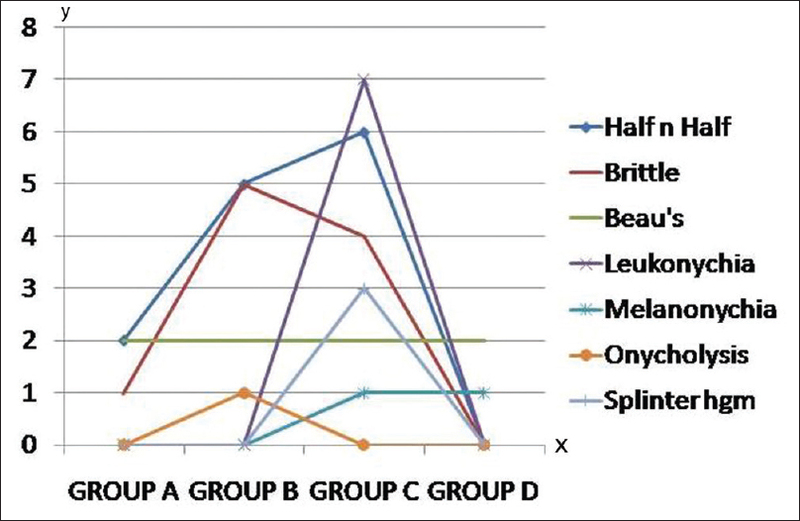 Group A had significantly less pigmentary alteration than Group C (P < 0.001) while Group D had lesser compared to Groups B and C (P = 0.002 and <0.001 respectively) [Table 2]. Hyperpigmentation was the most common type present in 21 (61%) patients followed by sallow color in 10 (29%) patients and slate gray pigmentation in 3 (8%) patients [Figure 2]. A total of 42 patients (42%) reported pruritus. The prevalence of pruritus was less in Group A than Group C (P = 0.011) while Group D had lesser pruritus compared to Groups B and C (P < 0.001) [Table 2]. A positive correlation between prevalence of pruritus and xerosis (P < 0.001) was noted. Among the study population, total 33 (33%) had cutaneous infections. Fungal infections were the most common type seen in 15 (45%) patients followed by viral infections seen in 11 (33%) and bacterial in 7 (21%) patients. A total of four patients was found to have the perforating disorder. The histopathology was consistent with reactive perforating collagenosis in three cases and Kyrle's disease in one. Calciphylaxsis and bullous dermatosis were not noted in any patient. A total of 43 (43%) patients showed nail involvement. Maximum prevalence was noted in Group C, 22 (88%). The nail involvement was significantly more in Group C compared to Groups A, B, and D (P < 0.001) [Table 1]. The most common nail finding was half and half nail seen in 13 (30%), followed by brittle nails in 10 (20%), Beau's line in 8 (18%) and leukonychia in 7 (16%) patients. Other findings included onycholysis, melanonychia, and splinter hemorrhage [Figure 3] and [Figure 4]. A total of 22 patients reported hair changes among which 19 reported alopecia and 3 patients (Group D) had hypertrichosis. Other findings noted were acne (1), ecchymosis (1), foot ulcer (1), and scabies (3). The value of hemoglobin ranged from 4.3 to 13.6 g/dl, while the mean hemoglobin was 9.1 ± 2.3. The blood urea levels ranged from the lowest 30 to 420 mg/dl with the highest being 113.4 ± 99.1. Cutaneous manifestations occurring in patients with ESRD can indicate systemic problems that have significant morbidity and mortality risks. Skin changes are sometimes a consequence of the disease that caused the renal failure or may be an ESRD manifestation. The most common cause of renal failure in our study was chronic glomerulonephritis (48%) followed by diabetes mellitus in (28%). These findings were similar to that observed in the study by Khanna et al,  where glomerulonephritis and diabetes were the cause of the kidney disease in 45% and 22% patients, respectively. In other Indian studies, the frequency of skin involvement recorded ranged from 96 to 100%, , which is similar to the data from the west. , The lower prevalence of skin involvement in our patients may be because the incidence of skin findings of uremia is decreased in post-transplant patients. Xerosis was the most common dermatological finding observed in the present study seen in 53% patients. This observation was consistent with Khanna et al. and Thomas et al. who have reported xerosis as the most common cutaneous anomaly seen in 72% and 66.7% patients respectively. The etiological factors involved in the pathophysiology of xerosis include atrophy of pilosebaceous follicles and eccrine sweat glands, lower levels of surface lipids, increased serum retinol, and Vitamin A levels. It has been suggested that there is less hydration of the stratum corneum, especially in patients with hemodialysis, which is believed to contribute to its presence. In accordance with the above observation, the prevalence of xerosis was significantly high in Group C.
Pigmentary alterations were seen in 34% patients. Similar results have been reported by Nunley  and Deshmukh et al. The pigmentation in patients with chronic renal failure is secondary to failure of the kidneys to excrete β melanocyte-stimulating hormone, which stimulates melanin secretion in the basal layer and superficial dermis. Picó et al. reported yellowish tinge in 40% patients, followed by hyperpigmentation in 22%. 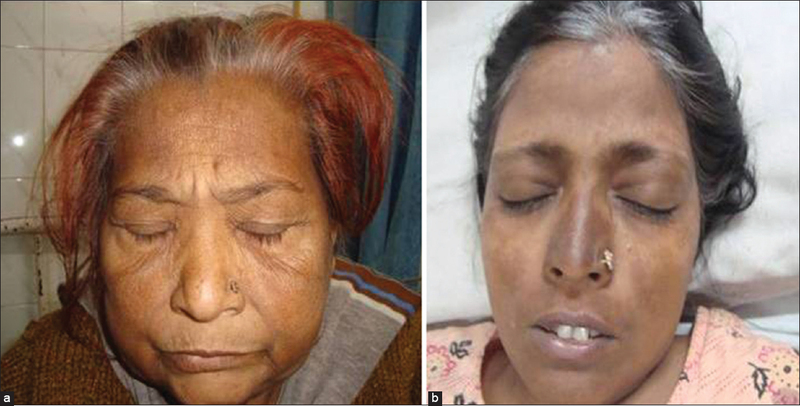 The lower prevalence of sallow pigmentation in this study may be due to the darker skin type of Indian patients. Total 33% patients had cutaneous infections. Similar findings have been observed in other Indian studies by Thomas et al. (26.2%) and Khanna et al. (29%). Total of 40% patients in dialysis group had skin infections similar to the findings by Udayakumar et al. (40%) and Deshmukh et al. (34.20%). Increased prevalence of infections in the dialysis population is postulated to be due to inflammation caused by the use of unsterile dialysate and non-biocompatible membranes during hemodialysis and also due to diminished B and T lymphocyte function and count. In the post-renal transplant patients (Group D), 15 out of the 33 (60%) patients had infections. Increased prevalence of infections in the post-transplant patients has been attributed to prolonged immunosuppressive state. Total four patients had perforating disorders. Positive association of this disorder with diabetes has been observed in the present study, wherein all the four patients with perforating disorders had diabetes. Trauma to the skin in patients with pruritus secondary to the renal failure may be the inciting agent in producing these lesions. The prevalence of nail changes in different studies varies from 34.4% as reported by Attia et al.,  10% as reported by Singh et al. and 64% as reported by Khanna et al. These findings are similar to that observed in the present study. The nail findings in patients of Group C were significantly more than in Groups A, B, and D. Picó et al. reported that the nail changes increased in prevalence with respect to the time in dialysis and were significantly more pronounced in patients receiving dialysis. The prevalence of nail involvement seen in post-transplant patients in the present study was 12%. However, Saray et al. have reported nail findings in 56.6% patients. The difference between the two observations may be due to the smaller sample size in the present study. In the post-transplant group (Group D), the prevalence of nail findings was 3 (12%). Similar figure has been reported by Saray et al. 17.1%. Renal transplantation has been shown to reduce the frequencies of half and half nails and splinter hemorrhage. A report by Bencini et al. documented no cases of half and half nails in 105 renal transplant recipients. This observation is in accordance with the finding noted in our study where the prevalence of half and half nail and splinter hemorrhage was significantly less among the post-transplant patients. In the present study, a positive and significant correlation was found between pigmentation, pruritus, xerosis, nail changes, and the blood urea levels. Dyachenko et al. found no correlation between pruritus and clinical parameters (underlying renal disease, duration and dialysis, presence of systemic disease) and chemical parameters did not reveal any statistically significant difference between pruritus and non-pruritus group. Amatya et al,  reported that patients with higher level of creatinine were more likely to have skin changes. Pruritus was found to be significantly associated with higher serum creatinine and hyperuremia, similar to the findings in our study. Falodun et al,  did not find a significant association between mean duration of disease and skin manifestations, which is in accordance with the results obtained in the present study. From the present study, it can be concluded that skin findings may act as clue to the underlying renal disease. The present study gives an overview of the cutaneous manifestations seen in the spectrum of CKD ranging from milder degree of renal impairment to dialytic complications in post-transplant patients. Barbam JM, Skorieicki K. Chronic kidney disease. In: Fauci AS, editor. Harrisons's Principals of Internal Medicine. 17 th ed. New York: McGraw Hill; 2008. p. 1761-2. Hajheydari Z, Makhlough A. Cutaneous and mucosal manifestations in patients on maintenance hemodialysis: A study of 101 patients in Sari, Iran. Iran J Kidney Dis 2008;2:86-90. Lugo-Janer G, Sánchez JL, Santiago-Delpin E. Prevalence and clinical spectrum of skin diseases in kidney transplant recipients. J Am Acad Dermatol 1991;24:410-4. National Kidney Foundation. K/DOQI clinical practice guidelines for chronic kidney disease: Evaluation, classification, and stratification. Am J Kidney Dis 2002;39:S1-266. Khanna D, Singal A, Kalra OP. Comparison of cutaneous manifestations in chronic kidney disease with or without dialysis. Postgrad Med J 2010;86:641-7. Udayakumar P, Balasubramanian S, Ramalingam KS, Lakshmi C, Srinivas CR, Mathew AC. Cutaneous manifestations in patients with chronic renal failure on hemodialysis. Indian J Dermatol Venereol Leprol 2006;72:119-25. Picó MR, Lugo-Somolinos A, Sánchez JL, Burgos-Calderón R. Cutaneous alterations in patients with chronic renal failure. Int J Dermatol 1992;31:860-3. Bencini PL, Montagnino G, Citterio A, Graziani G, Crosti C, Ponticelli C. Cutaneous abnormalities in uremic patients. Nephron 1985;40:316-21. Thomas EA, Pawar B, Thomas A. A prospective study of cutaneous abnormalities in patients with chronic kidney disease. Indian J Nephrol 2012;22:116-20. Falodun O, Ogunbiyi A, Salako B, George AK. Skin changes in patients with chronic renal failure. Saudi J Kidney Dis Transpl 2011;22:268-72. Nunley JR. Dermatological manifestations of renal disease. E Med J 2002; topic 550 (on line). Deshmukh SP, Sharma YK, Dash K, Chaudhari NC, Deo KS. Clinicoepidemiological study of skin manifestations in patients of chronic renal failure on hemodialysis. Indian Dermatol Online J 2013;4:18-21. Attia EA, Hassan SI, Youssef NM. Cutaneous disorders in uremic patients on hemodialysis: An Egyptian case-controlled study. Int J Dermatol 2010;49:1024-30. Singh G, Singh SJ, Chakrabarty N, Siddharaju KS, Prakash JC. Cutaneous manifestation of chronic renal failure. Indian J Dermatol Venereol Leprol 1989;55:167-9. Saray Y, Seçkin D, Güleç AT, Akgün S, Haberal M. Nail disorders in hemodialysis patients and renal transplant recipients: A case-control study. J Am Acad Dermatol 2004;50:197-202. Dyachenko P, Shustak A, Rozenman D. Hemodialysis-related pruritus and associated cutaneous manifestations. Int J Dermatol 2006;45:664-7. Amatya B, Agrawal S, Dhali T, Sharma S, Pandey SS. Pattern of skin and nail changes in chronic renal failure in Nepal: A hospital-based study. J Dermatol 2008;35:140-5.